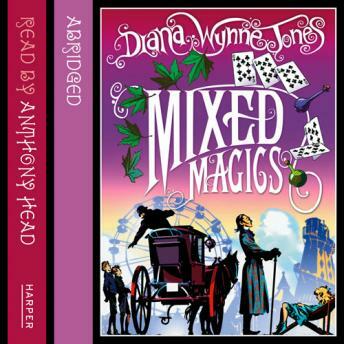 Anthony Head reads this spellbinding story collection, featuring Chrestomanci and many familiar friends and worlds. Four stories featuring the marvellous, enigmatic and embroidered-dressing-gowned enchanter, Chrestomanci! In which the Willing Warlock (from Charmed Life) is exiled to a world without magic and meets a formidable opponent - a little girl and her dog! In which Cat (from Charmed Life) and Tonino (from The Magicians of Caprona) are pitted against an evil enchanter with a dastardly plan. In which Carol, whose lucrative dreaming career is brought to an abrupt halt by a severe case of dreamer's-block, is sent to Chrestomanci in search of a cure. He takes on the case as a personal favour to her dad, whom he went to school with (in The Lives of Christopher Chant). In which the Sage of Dissolution wreaks havoc, thereby threatening the existance of all the worlds that have ever been!